There are many ways a business can improve its waste management. But at the other end, how can an organisation ensure the items it procures are sustainable? the costs of operation and maintenance of the products. Becoming a business that has a sustainable procurement policy is a journey that will typically involve incremental steps. Fortunately, in most cases it is a process a business can kick-off quite easily with the assistance of its suppliers and industry bodies. You can start by looking at how to buy recycled products for your business. Switching to 100% Australian recycled office paper like Planet Ark Paper & other paper stationery. Switching to 100% Australian recycled paper towels and toilet tissue like Planet Ark endorsed Naturale. 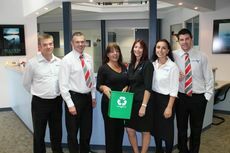 It’s important to begin discussions with your current supplier about sustainability and buying recycled. If your suppliers are sending your materials in hard-to-dispose-of packaging, ask them to change it. Poor supplier packaging can add to your waste disposal costs. It may also be handy to identify the key suppliers in the industry who are engaged in sustainability. This is where bodies like Good Environmental Choice Australia (GECA) and the Australian Packaging Covenant Organisation (APCO) can be particularly useful. Communication is the key to success, so the next step is to establish a ‘buy recycled’ policy as part of an overall sustainable procurement strategy. This policy can be used to communicate your commitment to buy recycled content products to suppliers, employees and clients. It is beneficial to ask suppliers to report on the recycled content of the goods they provide to enable your business to promote this information to clients. Don’t forget to schedule regular reviews to incorporate additional products with recycled content. Try searching our Recycled Products Directory. For more information on completing your sustainable procurement policy download the Australian Government’s Sustainable Procurement Guide and/or take GECA’s Positive Procurement Pledge. Find information about Victoria's Social Procurement Framework. Find out more about why buying recycled matters and check out the National Recycling Week research guide.